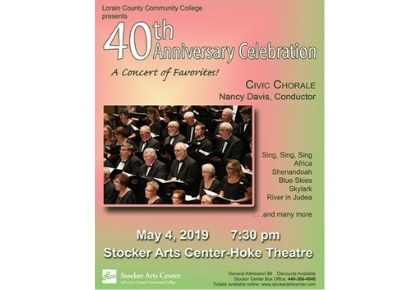 Under the leadership of Nancy Davis, Director of Choral Music Performance, the Civic Chorale is a 100-voice mixed chorus comprised of musicians from the Greater Lorain County and Northeast Ohio area. Membership is open to all who "love to sing" from advanced high school students to senior citizens. LCCC Civic Chorale is welcoming new members this semester. Please attend the next rehearsal from 7:30-9:30 p.m., Monday, January 14. Please contact Nancy Davis at ndavis@lorainccc.edu for more information.